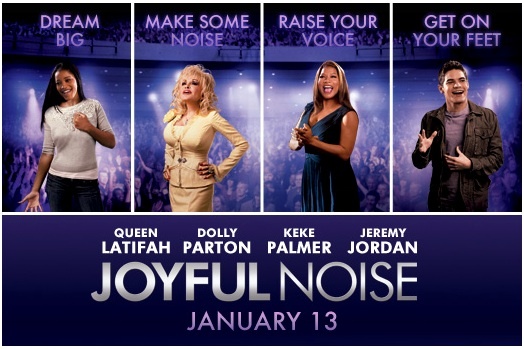 Joyful Noise is a formulaic movie. It’s practically written by trope. Everything that happens in it is predictable, easy, and uninspired. But, it’s not like it was trying to break new ground in it’s fluffy ease, it simply is what it is. What it is is the spiritual (ha! Get it?) cousin to Sister Act 2: Back in the Habit in so many ways. Underdog choir tries to win vague contest in far away Los Angeles? Check. Unassuming ingenue with kickass voice? Check. A last minute program change requiring everyone to take off their robes and rock the house with spiritualized pop music? Big check. Awkward old people awkwardly singing? Check. Noise tries to do new things in a few ways: character with Asperger’s Syndrome, several interracial romances that are in no way ever mentioned to be a problem, an extremely diverse gospel choir, and subplots about the economy and the military that are refreshingly just side mentions. Writer/Director Todd Graff does his best to load this low-on-plot film with many (many) distractions: 2 funerals, a club scene, a weak love triangle, teenage rebellion, way too many discussions on the nature of God, and 2 very long (but nice) solos with our diva stars Queen Latifah and Dolly Parton. And, the casting of famous singers, up-and-comers (Keke Palmer is particularly fantastic as is Jeremy Jordan who is the result of genetic experiments combining Zac Efron and James Marsden), and broadway vets make the several musical numbers enjoyable and well produced.